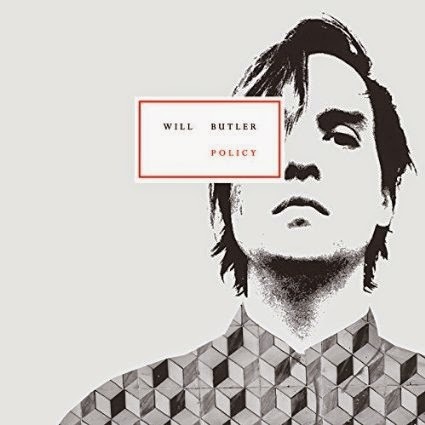 I had zero expectations from Will Butler and his solo debut, Policy. .....and in that way, they were all met, if not exceeded. Butler is a multi-instrumentalist for Arcade Fire, for which his brother Win co-founded. And make no mistake about Arcade Fire, it is Win's show and rightfully so, as he is a talented man though they have a talented band. Will is clearly talented too - as a musician, producer and innovative songwriter. Policy isn't really like an Arcade Fire disk, which is good, as it would be tough to live up to that. But it also shows that Butler is more than a member of that band. Clocking in at only eight songs and 27 minutes, there is not a lot of time to make a sound judgement. The 'n' is fairly small. Policy is stronger than it is weak - it has its good ("Son of G-d", "Witness", "What I Want" - because who doesn't love a song that uses the words 'pony macaroni'?) and bad ("Something's Coming") and the just ok ("Sing to Me" and "Finish What I Started") moments. You can hear Talking Heads influences. Devo too. And there is a Violent Femmes / Monkees (laugh if you must) vibe about the opener "Take My Side". I think people who get to the album will do so by Butler's name and past accomplishments, but that's not why they will stay. With Policy, he stands on his own and it will be interesting to see where he goes.